My mutant superpower is hair color retention. I dye my hair, and the color never fades. I dyed my hair black seven years ago. Since then, I have dyed only the new growth... yet the ends of my hair are the same dark black as the recently dyed hair. With me, the claims on the hair dye box become true... it really is PERMANENT dye. :P This permanence is great... unless I want to change the color. Bored of solid black, I went to the hair stylist to try for a black-to-purple ombre type color (if she could get the black dye to budge). The bleaching process went surprisingly well. The color lifted to orange with only one round of bleach. Then on went the purple dye... and my mutant superpower went into effect. Every strand of hair united to GRAB ALL THE PIGMENT! So instead of rinsing out to a nice bluish purple, the color stayed super dark. There is definitely purple in there. When I shampoo, the lather rinses out a beautiful shade of bright purple. If only my hair were that color! I'm told it will fade, and the purple will become more obvious. But I can practically hear my hairs saying, "Fade?! Muahahaha! We shall never fade! We shall retain every particle of pigment for all eternity!" One of my favorite bloggers, Meagan Kyla from Coffin Kitsch, just wrote about responsible spending and saving money. This was only two days after I gleefully wrote about my frivolous spending. Yikes! Have I become the little devil standing on people’s shoulders encouraging them to do bad things?! Nah. The truth is I am a big proponent of responsible spending. I carried debt when I was younger, and it was a heavy mental burden. In recent years, I have become quite frugal, and I’m much happier for it. I have established a system that really works for me. I set up direct deposit that automatically divides my paycheck: some goes into my retirement account, some goes into savings, a little bit goes into my fun money account, and the rest goes into my household/regular expenses account. Knowing my expenses are covered and I am saving appropriately, I can spend my fun money as frivolously as I want without any guilt. Of course, as I mentioned in my last post, it’s rare that I actually spend my fun money. Frugality has seeped into my bones and become part of me. ;) But I do believe we should all give ourselves a little treat now and then... though that treat can certainly be an experience rather than a purchase! After receiving my first package of treats, I debated whether to post about them. I have mixed feelings about “haul” posts. On one hand, they’re fun in a window-shopping sort of way. It’s interesting to see what’s out there in Retail Land, plus I like to see how people incorporate new items into their wardrobes or home decor. On the other hand, they can be a real downer for people who don’t have the means or opportunity to obtain similar hauls. 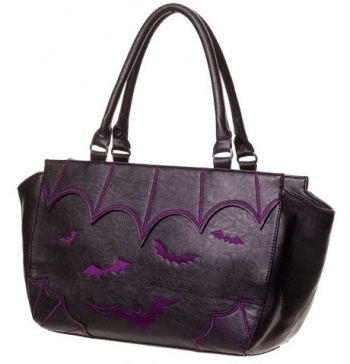 (I always feel guilty posting about Halloween stuff that is only available in the States.) Worst of all, if presented badly, haul posts can come across as bragging. Thus it is with some trepidation that I am doing a haul post. It’s really meant to be more a review post, as I made some first-time purchases. On to the cardigan! I love cardigans. LOVE them. But I need tall sizes thanks to my ridiculously long arms, which means my options are generally limited to plain cardigans from JC Penney or Old Navy. Bleh. :P I love decorated cardigans by brands such as Sourpuss and Banned; however, I never bought any because I knew the sleeves would be too short. But then I saw the Banned purple bats cardigan. More specifically, I saw that the sleeves went down over the model's hands... which meant they might actually reach my wrists. And they do! :D Hooray! Finally, the jewelry. Restyle has some pretty jewelry, but they’re always out of stock on their website. 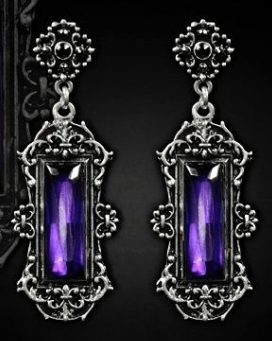 Alchemy Gothic pieces are gorgeous but expensive. Angel Clothing to the rescue! 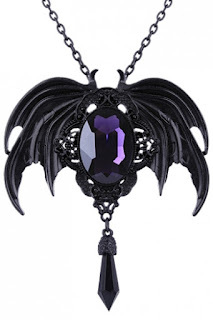 :) They had some Restyle jewelry in stock, and their prices on Alchemy Gothic jewelry were excellent… so I purchased from them. 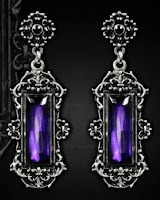 Restyle Vivian earrings: Large but not overly heavy. The stones are a very pretty shade of purple. Restyle Vespertilio necklace: A dramatic piece; large and quite heavy. I will have to be careful not to bend over and conk myself on the forehead with the pendant swinging forward. 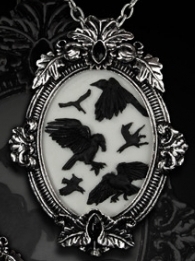 Restyle Flying Crows necklace/brooch: Very pretty! I like that it has a pin on the back so it can be worn as a brooch. 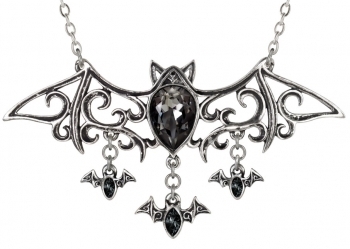 Alchemy Gothic Viennese Nights necklace: This is my first AG necklace and I absolutely love it! The metal has a nice patina and the crystals are lovely. Overall, I'm very happy with everything I bought. Angel Clothing has good prices and excellent service, and I'll definitely shop there again. Though it might be six months before I'm willing to spend frivolously again! This concludes my haul/review post. I very much hope it did not generate bad feelings in anyone! I said in my last post "I have returned." Yeah... well, perhaps not. I thought I was feeling better after having been ill, but it turned out to be just a brief respite. I haven't felt well for the last couple of months. A few days ago was my fourth doctor visit. I received a third diagnosis and a prescription for a fourth treatment. I'm moderately optimistic that the diagnosis is correct this time. The first diagnosis was an infection for which I was prescribed antibiotics. I was skeptical because I very rarely need antibiotics (maybe twice in the last 10 years). The second diagnosis was an allergic reaction. I was skeptical because I've never had allergies of any type. The third - and hopefully final! - diagnosis makes sense to me, though the doctor seemed skeptical. Heh. The main problem has been sleep disturbance. I'm sleep-deprived, and I feel lethargic most of the time. My brain has been so sluggish, even routine thinking has been a challenge. My coworkers probably think I've been replaced by an incompetent robot with faulty programming. Due to the insomnia, I've been doing a lot of late-night web surfing. Coincidentally, I was struck with my roughly twice-yearly urge to go shopping. Throw in the poor decision-making skills of a sluggish mind, and the inevitable end result was frivolous spending. I'm not upset, though, because honestly, it's about time I did some frivolous spending. :P I routinely set aside some "fun money" from every paycheck... but I rarely spend it because I'm too practical and frugal. Completely unrelated to my shopping spree (I made the appointment two months ago), I'm also looking forward to visiting my hair stylist Friday. She is going to add some purple to my hair and, if I'm brave enough, maybe give me a slightly different hair style. And I have slept progressively better the last two nights, so maybe I will be feeling well enough to actually enjoy all these new things!